For the first time, Mexico has a female attorney general - the highest post ever reached by a woman in this country. But elation at this achievement is overshadowed by grief over the brutal murders of women police chiefs and activists, and the persecution endured by the family of another woman who was killed in 2010. Forty-one-year-old lawyer Maricela Morales was confirmed on Apr. 7 by the Senate as attorney general, one of the most strategic posts in the government of conservative President Felipe Calderón. Among the pending cases that have landed in her lap are two that have created shock waves in the last four months, in a society already accustomed to death: the killings of two women's rights defenders and the implacable persecution of the family of social activist Josefina Reyes. 'Women are not spoils of war. 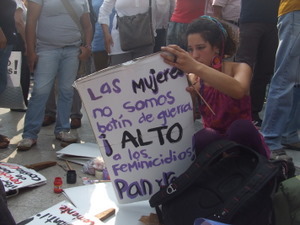 Stop the femicides (gender-based murders of women)!' read one of the placards carried at a march against violence Apr. 6 in Mexico City and a score of other cities in this Latin American country. The northern state of Chihuahua, whose main border city Ciudad Juárez has been notorious since 1994 for its hundreds of unsolved killings of young women, mainly factory workers, has again captured the world's attention for the violence unleashed by President Calderón's strategy against drug trafficking cartels, which has transformed the north of the country into a war zone. The generalised slaughter had hidden gender-based violence, but last year this shot up again in the state with more virulence and hatred. The organisation Justicia para Nuestras Hijas (Justice for Our Daughters) has documented the disappearance of 36 women and 71 girls and teenagers, in Chihuahua in 2010. One case that shocked the country, and especially gender rights activists, was the Dec. 17, 2010 killing of Marisela Escobedo, in front of the Chihuahua state government palace. For two years, Escobedo had been protesting the release of her daughter Rubí's partner, who had confessed to her murder. Then on Jan. 11, Susana Chávez, a 36-year-old poet and women's rights activist, was raped and murdered in Ciudad Juárez. In February the Reyes Salazar family lost three more members to attacks that began in January 2010, with the murder of Josefina Reyes, a human rights activist who had been demanding justice for the death of her son since 2008. The vendetta against her family has included the murders of two brothers and a sister-in-law, and the burning down of her mother's house, in the face of complete inaction on the part of the authorities. The violence across Mexico has led to another phenomenon, which also began in Chihuahua: the appointment of women to responsible positions in the police service. But two women police chiefs have already been murdered. In October 2010, Hermilia García became the first female police chief, in the municipality of Meoqui, 70 kilometres from the city of Chihuahua, the state capital. But less than two months into her new job, she was murdered by hired killers. Also in October, Marisol Valles, a 20-year-old criminology student, was appointed chief of police in the municipality of Praxedis, in Valle de Juárez. She was the only person willing to take the job after her predecessor was murdered and even the local priest had fled the village. The news of her appointment circled the globe. In March, before she had even been in the post for six months, she and her family fled their home and applied for asylum in the United States, because they had received so many threats. On Mar. 29, Brenda Carrillo, commander-in-chief of the Chihuahua state police, was murdered along with her five-year-old daughter. They were gunned down in a hail of bullets as they arrived at the little girl's school. 'Women's struggle is about taking two steps forward and one step back,' said de León. 'And if you take into account that the country is going down a road that helps no one, it might appear that nothing good is happening at all, but there are good thing going on. For instance, there was a victory in Mexico City for the rights of homosexuals,' she said, striving to maintain a positive outlook. 'The debate is no longer about whether gay people can marry or not; that is an accepted fact. Now the discussion is whether they can have children, but the issue of marriage is settled,' said de León, who until recently was the head of Semillas (Seeds) - Sociedad Mexicana Pro Derechos de la Mujer - an organisation that has been working to empower women for 20 years. Martha Lamas, a veteran activist for women's reproductive rights, shares this view. 'It's clear that public policies on reproductive health have taken a step backwards in states governed by the (conservative ruling) National Action Party (PAN), but there have also been significant legislative gains, and women themselves are much more conscious about fighting for their rights,' Lamas told IPS during last week's nationwide march against violence. She said she regarded the November 2009 verdict handed down by the Inter-American Court of Human Rights against the Mexican state, in the 'Cottonfield case', involving the 2001 murders of three women aged between 15 and 20 in Ciudad Juárez, as a key milestone. Lamas said that the state 'in the long term will have to comply with the sentence,' which cannot be appealed. The Inter-American Court found Mexico guilty of violating the rights to life, integrity and personal freedom, and of failure to properly investigate the crimes, which the state has still not done. As part of the ruling, the Court ordered municipal, state and national governments to implement the Alba Protocol, an urgent, comprehensive search mechanism to be triggered the moment a girl or a woman is reported missing. So far this has only been done in two cases of disappearance in Ciudad Juárez, in March and June 2010, to no avail. Mexican women received encouragement in their battle against violence in March, when U.S. Secretary of State Hillary Clinton presented Morales, Mexico's new attorney-general, with the 2011 International Women of Courage Award for her former work as deputy attorney general for special investigations against organised crime. Women's rights organisations view Morales' promotion as a victory, not only because she is a woman, but also because she is replacing Arturo Chávez, whose appointment was severely criticised by these groups because of his negligence in dealing with femicides when he was state attorney general in Chihuahua.